Induction into the Phi Beta Mu International Hall of Fame is the highest honor bestowed upon a fraternity member. In 74 years of Phi Beta Mu history, only six members have received this recognition. Induction into this prestigious group of individuals implies a significant contribution not only to our profession, but also to the growth and vitality of the International organization. Phi Beta Mu International announces the induction of three of our most distinguished colleagues: Richard Crain, Robert Eklund and James F. Slutz. All three of these gentlemen acted to facilitate the communications of our organization from the traditional medium of print to the virtual communication of the contemporary website. They have served Phi Beta Mu with passion and integrity and we acknowledge their long service and commitment to the International organization and our profession. The scope of the Phi Beta Mu International Bandmasters Fraternity would be not be what it is today without the contributions and sacrifices of these gentlemen. We are grateful for their gifts of time, energy, and expertise. They have given of themselves and we are richer for it. The debt is ours…thank you! Music educator, administrator, consultant, adjudicator, clinician, lecturer, and leader, Crain is Past President of the Texas Bandmasters Association, Alpha Chapter of Phi Beta Mu, and the Texas Music Adjudicators Association. He has served as the Coordinator for the National Concert Band Festival for Bands of America since 1991, and served on the Board of Directors of the Midwest International Band and Orchestra Clinic for the past 18 years and continues to serve in the role of President. 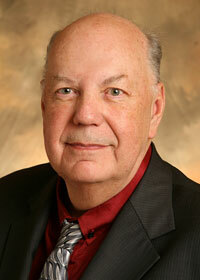 Richard Crain served as Executive Secretary of Phi Beta Mu International for over 30 years. He was the constant figure through eight presidents and many board members. He was the single person that saw us through the transition from the 1970s into the new millennium. His strong conviction and gentle spirit have left an indelible mark on the identity of our organization. Crain has been honored by the National Federation of Interscholastic Music Associations, receiving the Outstanding Music Educator Award for Texas in 1994 and 1995, and was acknowledged by the Texas Bandmasters Association as Texas Bandmaster of the Year in 1994. 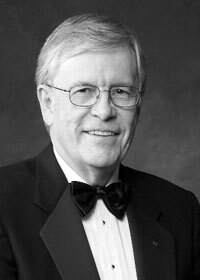 In 2006 Crain received the Texas Bandmasters Association Lifetime Administrator Achievement Award. After 45 years of service, Crain remains a passionate and committed advocate for music education. Robert Eklund is the President of the World Association of Marching Show Bands. He is an internationally recognized adjudicator. Recently he was inducted into the Phi Beta Mu International Bandmasters Fraternity Mu Alpha Hall of Fame. He is a continuing jury member of the Sudler Shield competition for Marching Bands in the United States of America and twice a jury member of the Kerkrade World Music Contest competitions in the Netherlands. A recipient of the John Phillip Sousa Foundation’s Legion of Honor Award, he was also presented with Band World’s Prestigious Phoenix Award as one of the ten best North American Band Directors in Music Education. He also received the Canadian Band Association’s International Award for best representing the ideals of their association around the world. Mr. Eklund is a Life Member of the National Band Association; a Life Member of the World Association of Symphonic Bands and Ensembles; a Past President of the Canadian Band Association; and twice Chairman of the North American Band Directors Coordinating Council. Robert Eklund is a charter member of Phi Beta Mu – Mu Alpha Chapter in Alberta, Canada (1978), and served as Mu Alpha Chapter President from 1989-1996. He developed the first website for Phi Beta Mu International at the request of International President Keith Mann in 2001. Mr. Eklund has been the webmaster for Phi Beta Mu International since its inception and he remains the chief adviser to the website committee. James F. Slutz’s career as an educator has taken him from Missouri to Florida to Indiana in capacities as choir director, conductor, lecturer, band director, high school principal, and director of music at the university level. In 1969 he left his position as Director of Educational Activities for Streep Music at the invitation of Florida Southern College. FSC requested him, as their new Director of Bands and Music Education and department chair, to restructure their band department. He went on there to establish the third music business program in the U.S. In 2005 he was invited to develop and teach the music business curriculum at the main campus of Shenyang Conservatory of Music in Shenyang, China. With his wife Shirley, Jim spent six months teaching eager Chinese students about the intricacies of a music business education. James Slutz was the Editor of the Phi Beta Mu Report for over two decades – a role he executed with passion, dedication and integrity. He is the founder of NAMBI [NAMM Affiliated Music Business Institutions] and the Orlando Junior College Community Band. Mr. Slutz’s professional affiliations include: Phi Beta Mu [International Editor of Phi Beta Mu Report]; Legion of Honour Committee for John Philip Sousa Foundation [Chair]; Streep Music [Director of Educational Services]. His academic appointments include: Director of Music [Indiana State University]; Director of Bands and department chair [Orlando Junior College, FL and Florida Southern College, FL]. Jim has served on the boards of: John Philip Sousa Foundation; International Music Camp at Peace Gardens; Lakeland Symphony; Terre Haute Symphony; Lakeland Concert Association; the Orlando Community Concert Association. His most recent honour was his election to the membership in Pi Kappa Lambda, National Music Honor Society. Eldon Janzen was Director of Bands at the University of Arkansas from 1970 to 1995. In addition to serving as Director of the marching band and conductor of the symphonic band, he taught instrumental methods and graduate conducting. He was Interim Chair of the Music Department in 1983 and continued as Coordinator of Music Education from 1983 to 1995. Professor Janzen received his Bachelor of Music Education degree from Oklahoma State University and his Master of Music Education degree from North Texas State University, where he also served as Assistant to Director of Bands Maurice McAdow. Mr. Janzen taught in the public schools of Oklahoma and Texas for 14 years before he was appointed Director of Music Activities for the Irving Texas school system in 1966. During this time, Mr. Janzen developed band programs which consistently produced outstanding performing organizations in both marching and concert competition. His professional affiliations included American Bandmasters Association; Music Educators National Conference; College Band Directors National Association; Kappa Kappa Psi; Tau Beta Sigma and Lions International. Mr. Janzen has served as President of Texas Bandmasters Association; President of Southwest Division of CBDNA; President of Arkansas Bandmasters Association and President of Phi Beta Mu International. He has been honored for his contribution to music education by membership in the Arkansas Phi Beta Mu Hall of Fame. He received the Phi Beta Mu International Award for outstanding contribution to music, was named Life President of Arkansas Bandmasters Association, and is a recipient of the Distinguished Service citation by Kappa Kappa Psi. His textbook Band Director’s Survival Guide was widely used in instrumental methods courses throughout the country. Jack White received his Bachelor of Music Education degree from Northeast Louisiana State College in 1957 and his Master of Music degree from Louisiana State University in 1961. In 1958 he began his teaching career in Monroe, La. after serving in the U.S. Army, where he completed Airborne training. From 1964-1970 he was Director of Bands at Ouachita Parish High School, and from 1970 served as Director of Bands and Associate Professor of Music at Northeast Louisiana University, retiring in 1991. In addition to his teaching duties, Mr. White has served as adjudicator, clinician, consultant, guest conductor and guest lecturer at centres throughout the U.S. In 2010 he received the Lifetime Achievement Award for his contribution to Music Education from the South Central Music Educators Society. Colonel Earl D. Irons conceived and founded the national honorary bandmasters fraternity of Phi Beta Mu. “Colonel” Irons was born on a farm in Hopkins County, Texas. His music education began at age 4 on the violin. After playing snare drum in a community band, he traded instruments with a cornet player and thus began a career as a cornetist. His early instruction on cornet was by G.W. Blake, an English bandmaster. Earl Irons attained the title “Colonel” when he was made Lt. Colonel on the staff of Governor of Texas by Governor James V. Allred. “Colonel” was presented with an honorary Doctor of Music degree in 1942 by the Zoellner Conservatory of Music in Hollywood, California. He became a member of the American Bandmasters Association in 1936, and from 1940 through 1948 he was a member of the ABA Board of Directors. One of the great pioneers of American music education, Earl Irons composed numerous pieces for both bands and brass instruments. His most popular publication was an instruction book for cornet, Twenty-Seven Groups of Exercises. 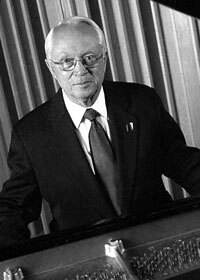 Jack Harold Mahan, Honorary Life Member of the American Bandmasters Association, was born in Fort Worth, Texas. Over the years he served as ABA’s President, Secretary-Treasurer and Board member. Jack attended North Texas State Agricultural College where for several years he was an assistant to ABA member Col. Earl D. Irons, legendary band director at the school. After pursuing graduate courses at the Chicago Conservatory, he received a Master of Education degree from Southern Methodist University. In 1956 he succeeded Col. Irons as Director of Bands at the Arlington State College, later to become the University of Texas at Arlington. He was one of the first members initiated into Phi Beta Mu. He served as their Alpha Chapter president three times and Chapter secretary for 26 years and was elected Honorary Life Member and Honorary Life Executive Secretary of Phi Beta Mu. He was also made an Honorary Life Member of Kappa Kappa Psi, Tau Beta Sigma and Phi Mu Alpha Sinfonia. Dewey Otto Wiley, musician and band director, was born in Alexander, Texas. His unofficial title of “Father of Texas Bands” was earned partially because of the large number of his students who became Texas band directors, but primarily through his pioneer work with the Texas Music Educators Association and its predecessors. As a child he taught himself to play violin through a mail order violin method. He attended Midland College where he conducted the school orchestra and taught violin. In 1922 he formed the famous Hardin–Simmons University Cowboy Band that toured the United States and Europe. He was Band Director at Texas Technological University from 1934 until his retirement in 1959. It was during a Texas Tech summer band camp that Colonel Earl D. Irons founded the Alpha Chapter of Phi Beta Mu with the help and encouragement of Dr. Wiley and other band directors attending the camp. Dr. Milburn E. Carey was born in Marion, Indiana. A noted music educator for 47 years, he was managing director of the Tri-State Music Festival in Enid, Oklahoma. This festival attracted up to 22,000 participants annually, primarily from Texas, Oklahoma and Kansas. He is listed in “Who’s Who in America” primarily due to his long-term contributions in band, orchestra, choral and drum and bugle corps music. These activities were achieved primarily through his positions as the bandmaster and director, School of Fine Arts, Phillips University; choir director at First United Methodist Church; and director of the American Legion “Legionettes,” all in Enid. He served as national president of Phi Beta Mu for 23 years and was named International Honorary Life President.